It is with deep sorrow, the Lwaya family announces the sudden and untimely death of Timothy Kavoi Lwaya of National Youth Service on 23rd September 2017, following a tragic Road accident along Kivandini-Kyasioni road off Nairobi -Garissa Road. 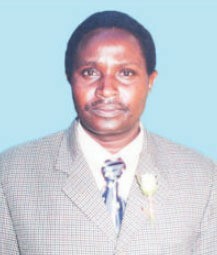 Husband of Ann Mutio. Father of Stephen Kavoi, Anthony Mutuku, Augustine Mule, Musyoki,Daniel Munywoki of KeRRA and Naomi Mutile. Son of the late Kavoi Lwaya and Theresia Mutile, step son to Grace Mwikali. Brother of Sammy Kimani, Mulei, Musyoka, Mutata,John, Mutinda, Ndambuki, Kyalo, Sabbeth and Ndunge. Son-Inlaw Late Mutuku Mwole and Esther Mamboleo. Brother-Inlaw to Wambua, Nzau, Late Mutie, Nzivo,Wambui and Mary Nthangu. Uncle to Josephat Mulei, Ruth, Mutiso, Mary, Carol,Kavoi, Kasyoki, Mutuku, Mutile, Muli, Mwangi, Esther, Nthenya, Kanini, Musyawa, Katio,Mule, Nyamai, Mutunga, Mercy, Grace, Wanza, Ndunge, Makau, Mbatha, Maina, Mutie, Esau, Musyok, Nduku, Yoana,Mueni, Michael Muasa and Grand Father to Janinah mamboleo. Family and Friends are meeting at Garden Square on 28th Thursday 2017 from 6.00PM and at his Home Ngengi Village. The Cortege Leaves Kenyatta University Mortuary at 7.00AM on Tuesday 3rd October 2017.The funeral will be held at 11.00AM same day at Ngengi Village, Kaluluini Sublocation, Matuu Location, Machakos County.